Step One: Add Chocolate. Step Two: Add MORE Chocolate! Now add 20g of protein and what do you get? 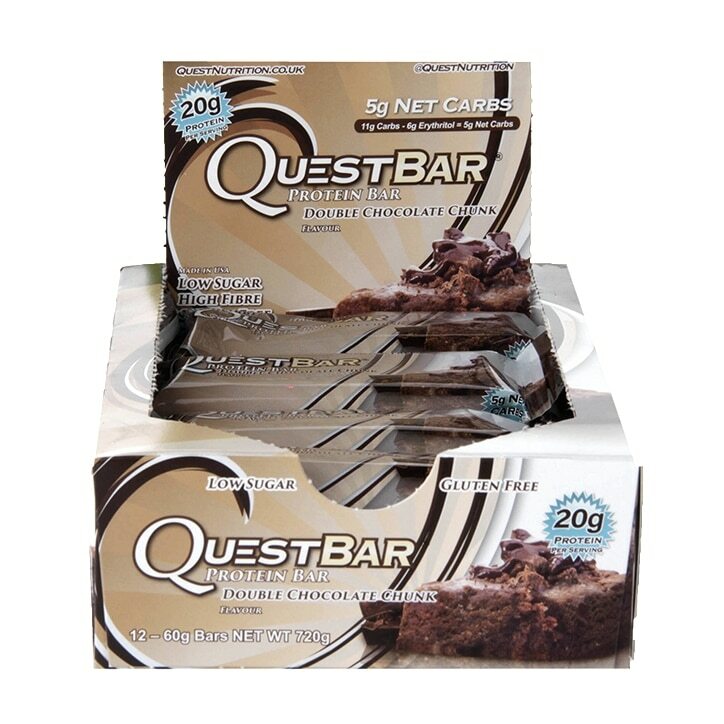 The Double Chocolate Chunk Quest Bar! And with 5g net carbs*, this is a #CheatClean surprise that tastes as good as it is good for you! Sweetened with Stevia Extract. Protein Blend (Milk Protein isolate, Whey Protein isolate (Milk)), Soluble Gluco Fibre, Dark Chocolate Flvour Chunks (12%) (Cocoa Mass, Whey Protein Isolate (Milk), Bulking Agent (Erythritol), Cocoa Butter, Sea Salt, Flavouring, Sweetener (Steviol Glycosides)), Almonds, Water, Bulking Agent (Erythritol), Cocoa, Flavourings, Palm Oil, Sea Salt, Colour (Calcium Carbonate), Sweetener (Steviol Glycosides)..
Quest Protein Bar Double Chocolate Chunk is rated 4.0 out of 5 by 4. Rated 5 out of 5 by Rhubarb27 from Very tasty! I bought a box of these about a week ago (without having tried them first) and I'm glad to say that the gamble was worth it! They're a good consistency - a bit chewy like a brownie and the chocolate chips really help to keep them interesting. Also was a bit worried they'd be too sweet or artificial, but they weren't :) will definitely be buying again and maybe trying the other flavours! Plus the macro profile is hard to beat! Rated 1 out of 5 by Binky28 from Awful! This is a dreadful tasting product. It has a very strong chemical taste,with a very unpleasant aftertaste. I could only manage one bite,it was dreadful. Rated 5 out of 5 by Beckyairey from Amazeballs! This is one of the best protein bars I've ever tasted! So chocolaty and really low sugar so a great guilt free treat after a workout. Best heated up in the microwave for 20-30 seconds until the chocolate chunks melt - lush!